Dinner- Cook something for him or together. Make it something you haven’t tried before or stick to a tried-and -true favorite. Your choice. Go all out. This is a special dinner. Date- Go on a special date. Not a dinner-and-a-movie date. You cant talk in a movie theater! Want some spontaneity? 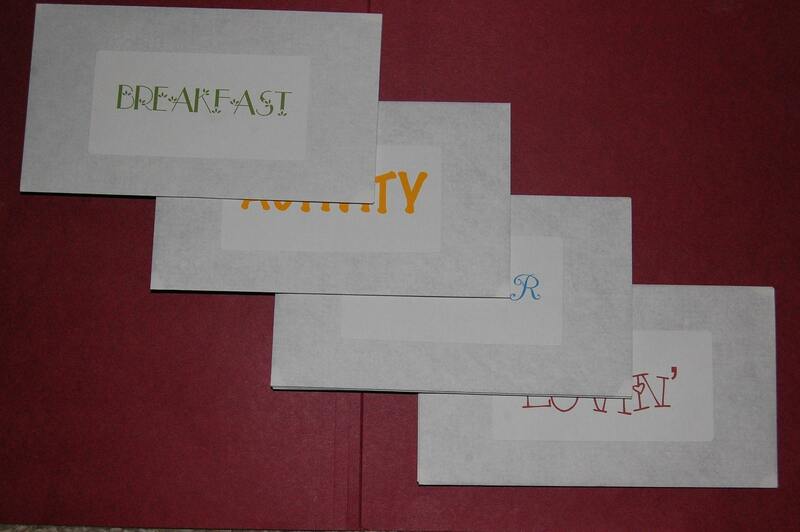 Hurry and order yourself a “Pick the Envelop” Date kit and you won’t even have much to plan! It’s a date designed for all day, but is super simple to rearrange to fit your personal needs and time frames. If you would like a digital kit instead (priced at $10) please let me know. I’ll get you all set up. Dedication- Call into a radio station and dedicate a song to your sweetheart. Make sure they are listening! Or do your dedication a little less publicly. A love letter is always a winner. Drinks- Put the kids to bed and relax in the cozy chairs! You know the ones everyone is fighting for all day long. At least that’s what happens at my house. Enjoy your favorite beverages and take the time to talk and get caught up in each other’s lives. You’d be surprised how different and separated the lives of husbands and wives can be. Or actually go out for drinks. Whether it’s something served in stemware on a table cloth or slushies at Sonic, it doesn’t matter. Detective- Come up with a fun treasure hunt to go with your sweetie. It can be as elaborate or as simple as you care to plan. For some extra fun, make it a ransom situation. Hold something for ransom and you have to complete the treasure hunt to get it back. This could even be you. Leave clues around and be waiting for your sweetie somewhere. Doctor- Play Doctor. ‘Nough said. Dollar: Go to the Dollar Store. You each get one dollar. Who can get the best gift for the other? Dozen: Roses, cookies, brownies, chocolates, kisses, coupons, dollars, a 12 pack of his fave soda, anything you can get 12 of! Twelve petals with 12 reasons you love him. Whatever you can think of. Double Dose: Sets of two would be a nice surprise. His fave dinner and dessert! A back rub and a foot rub! Before bed and in the morning!